Aureus, struck 16 BC in Rome. Obv. : IMP CAESAR TR POT IIX, Augustus head, laur., r. Rev. 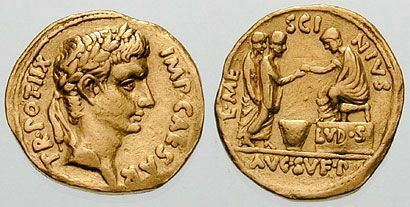 : L MESCINIVS / AVG SVF P, Augustus, togate, seated l. on stool on platform inscribed LVD S, giving suffimenta to one of two togate figures.